We’ve got a very good feeling about this. Welcome to May the Fourth, the annual fan celebration of all things Star Wars. With the recent release of The Force Awakens, this is shaping up to be an excellent day to rewatch the movies for the hundredth time, catch up on your comic-reading, or just don your Jedi costume with pride. This wordplay holiday (hey, that rhymes!) is also basically the Black Friday for all things Star Wars, so here are some of the top deals to help you save a few bucks as you honor the galaxy far, far away. No smuggling required. -Disneyland Resort is hosting a celebration that includes special merchandise, a trivia night, and a showing of a fan-favorite episode of Star Wars Rebels. -For non-locals, the Disney Store always has sales on toys, figurines, apparel, and housewares. -Amazon Video has The Force Awakens for sale, and it’s giving away three free Star Wars comics with purchase. -Google Play is discounting a large selection of Star Wars mobile games; we recommend Star Wars Pinball. If you favor iOS, the App Store has pretty much the same selection on offer. -Select Star Wars games will be up to 77% off on the PlayStation and Xbox stores. The biggest cuts are on titles for the older consoles (snag Dark Forces if you haven’t already), but the new systems do get discounts on Star Wars Battlefront. -If you’re building a PC gaming library too, Steam and GOG.com are also running up to 77% off Star Wars game like the X-Wing series, Knights of the Old Republic, and Lego Star Wars: The Complete Saga. Voice. Changing. First Order helmet. Come ON. -Humble Bundle is doing the same up to 77% off deal as the other major retailers, but with the added bonus of some proceeds going to charity. -ThinkGeek has sweeping Star Wars sales, with 20% to 60% off more than 200 items. Orders of more than $30 also receive a free BB-8 pin. -GameStop will kit you out with sales on collectibles, housewares, accessories, and a free copy of Star Wars Battlefront as part of its PS4 bundle. -LEGO has several deals for the superfan, including 10% off select Star Wars sets and a free stormtrooper toy for qualifying orders. -Best Buy has $20 discounts on its Star Wars-themed wired Xbox One controllers. -Target is giving away free $10 gift cards when you spend $50 on Star Wars items online, but only on May 4th. 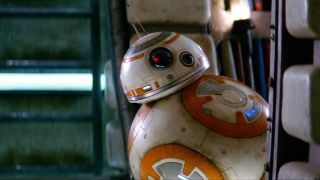 -Sphero’s BB-8 toy is on sale for $20 off. -Buy four UT shirts from Uniqlo and get the fifth free. The clothing brand just added several new Star Wars-themed designs. -Titan Magazines has subscription sales for three of its titles. Get the next eight issues of Star Wars Insider for $38.50. It’s also got 30% off six issues of Star Wars Rebels and 25% off six issues of Star Wars Jedi Master.